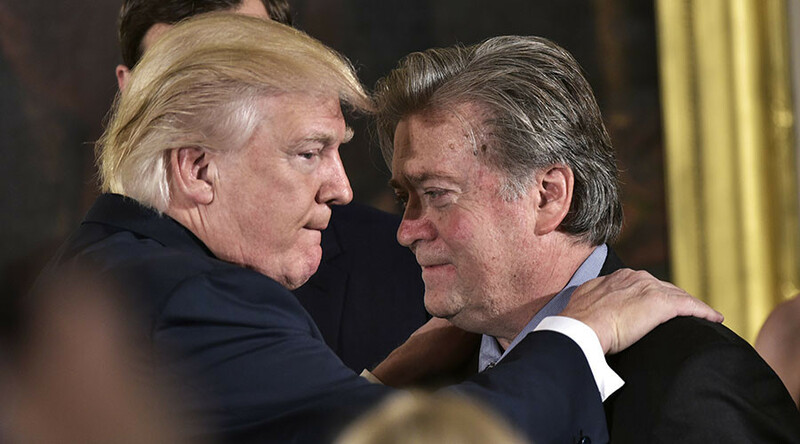 The photo-editor of China Daily reportedly didn’t notice a Nazi link in a cartoon depicting President Donald Trump and his chief strategist Steve Bannon, with the latter wearing a red Nazi arm band as the pair stand together on the bow of the sinking Titanic. Named ‘Trump-tanic’, the image shows an Uncle Sam figure vomiting overboard and the Statue of Liberty cowering in the background as Trump and Bannon stand with arms outstretched on the bow, echoing a scene from the 1997 Titanic film. The cartoon was illustrated by Bangkok-based French artist Stephane ‘Stephff’ Peray, who shared the illustration on Twitter on February 3. A variation of the image is currently listed on the Saatchi gallery website for $180. Peray seems to have an affinity for drawing unflattering and highly politicized depictions of Trump. Other illustrations by the cartoonist show the US president offering Islamic extremists a travel ban ‘gift’ and waterboarding the Statue of Liberty. The ‘Trump-tanic’ cartoon was published by China Daily on Monday and was still posted to their website at the time of writing. The paper’s photo editor said she chose the cartoon because it was interesting and did not notice the Nazi link, according to BBC China Correspondent Stephen McDonell. The image has drawn a varied response online, with some Twitter users decrying the publication of the image and others defending it as freedom of expression.